It's been a very hot summer so far, the kind where you don't feel like cooking and heating up the oven or turning on the stove. 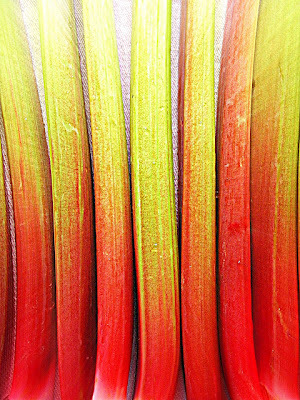 However, I was so excited to have finally found a bunch of fresh rhubarb stalks in a supermarket the other day that it no longer mattered how hot the weather was. I had to cook this savory dish. I adore rhubarbs for they are nutritious and very tasty. 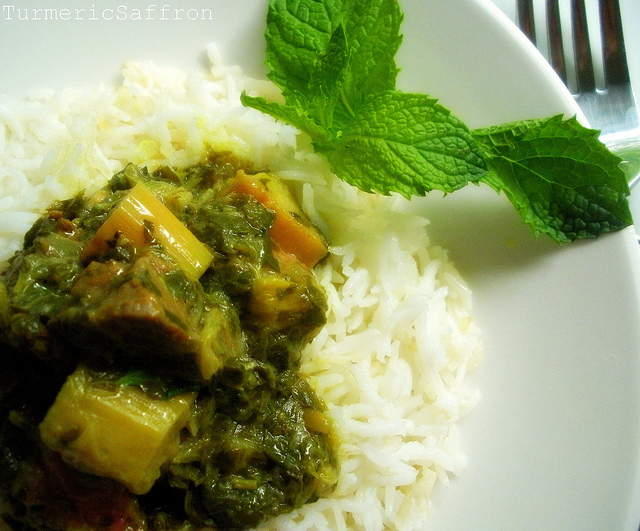 I loved rhubarb stew as a kid and I still enjoy its well-balanced tart and sweet taste, served over warm and aromatic rice. I cherished the opportunity to make this delicious sweet and sour lamb stew with fruity flavored rhubarb simmered to perfection in a green sauce filled with chopped parsley and mint. This is a delightful dish that will please your taste buds and is worth the time and the effort that goes into making it. 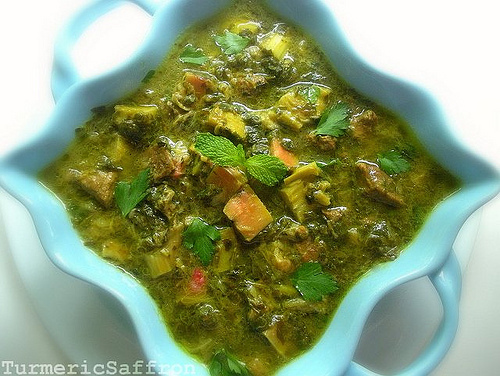 خورش ریواس - Khoresh rivas - Rhubarb stew is pretty much prepared the same way as celery stew (khoresh karafs). 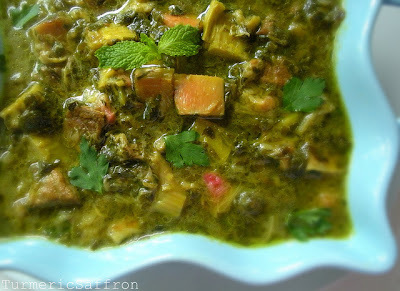 The main difference is that in celery stew you add lemon/lime juice to bring out the flavors and make it tastier whereas in preparing rhubarb stew there's no need to add more acidity to the dish. 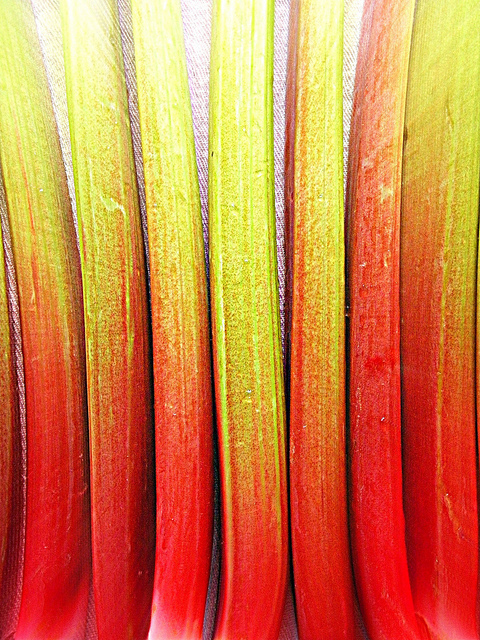 In order to balance the tart taste of rhubarb, sugar is added to a bring about a perfect sweet and sour consistency. In a pan, heat 2-3 tablespoons of oil and saute chopped onions until translucent. Add turmeric, stir, add the meat and brown on all sides. Add salt and pepper to taste. Pour enough water to cover the meat. Cover and cook for an hour on medium to low heat. In a medium-sized frying pan, saute the chopped parsley and mint together in 2 tablespoons of oil over medium heat.Combine the parsley and mint mixture with the meat sauce half way through the cooking. Add water if necessary. Lightly saute sliced rhubarbs in 2 tablespoons of olive oil for 2-3 minutes on medium heat. Add the rhubarb to the pot, lower the heat to a gentle simmer and cook for an additional 15 minutes. Taste and add 2-3 tablespoons of sugar or to taste, gently stir and cook for an additional 5 minutes. crying, "Why do you set fire to me? You chose me, bought me, brought me home for this?" The cook hits it with the spoon into the pot. No! Boil nicely, don't jump away from the one who makes fire. 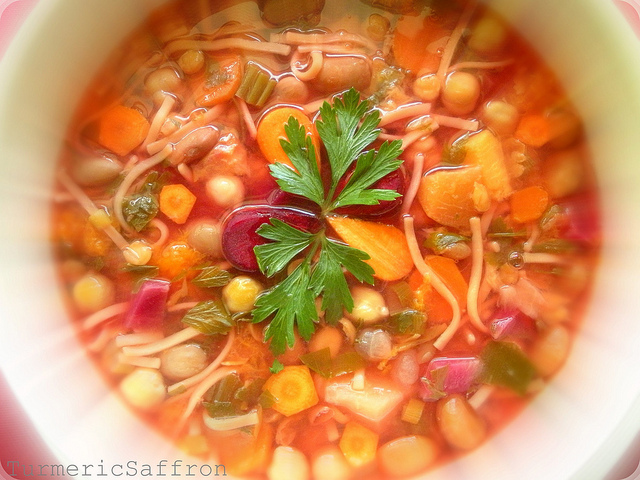 Through boiling you may grow flavorful and nourishing, and united with vital human spirit. I don't inflict suffering out of spite. you drank rain for the sake of this fire. After beans have been soaked place them into a large pot, add 6 cups of water covering the beans. Bring to a boil, reduce heat to medium, cover and cook for 50 minutes. Add the chopped vegetables, stir. In a small skillet, heat 2 tablespoons of olive oil and saute onions until golden brown. Add turmeric, stir well, add the minced garlic, cardamom and red pepper flakes and saute for 3-5 minutes. Add the content of the skillet (onion, garlic and the spices) to the pot and continue cooking for another 10-15 minutes. Add noodles and more water if needed. Add the fruits to the soup and simmer on the lowest heat setting for another 20-30 minutes, allowing the fruits to cook and the flavors to blend without boiling so that the fruits hold their shapes and don't become too mushy. Taste and adjust the seasoning and add lemon juice to taste. *Variation: This is a wonderful and rather sweet version of the above recipe. This is more or less the same recipe as above but the following changes were made. In addition to the fruits and vegetables I've also added a medium-sized beet (peeled and cut into small pieces) and a small sliced carrot. Instead of a cup of chickpeas I used 1/2 a cup of chickpeas and 1/2 a cup of yellow split peas. I didn't use any spices other than salt and pepper. No sauteed onion and garlic either. For a sweeter taste I added a tablespoon of honey. You may add a tablespoon of sugar. This soup has a beautiful color as well as an interesting and delicious taste. 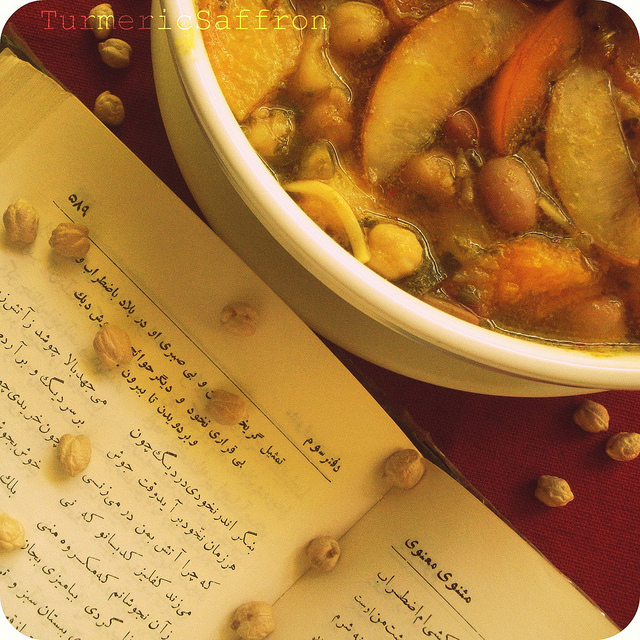 I've always loved the taste of fresh and simple باقالی پخته cooked fava beans/broad beans (baghali) with a dash of salt, a sprinkle of groundگلپر golpar (angelica) and a squeeze of fresh lemon. 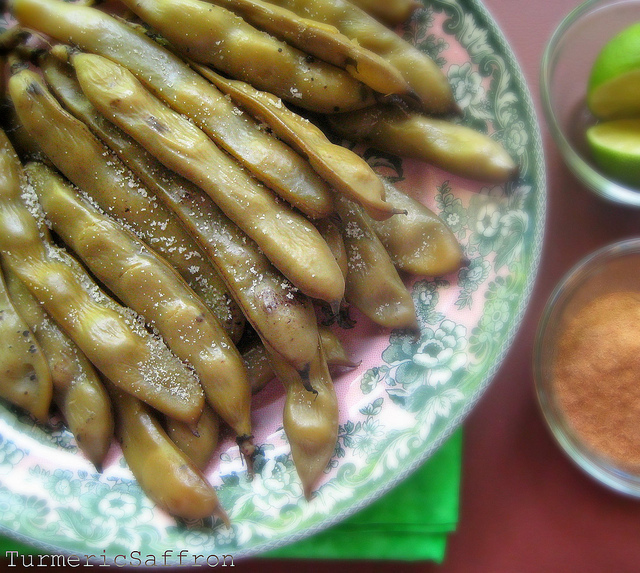 I grew up with fava beans and that's how it was always prepared in our home. 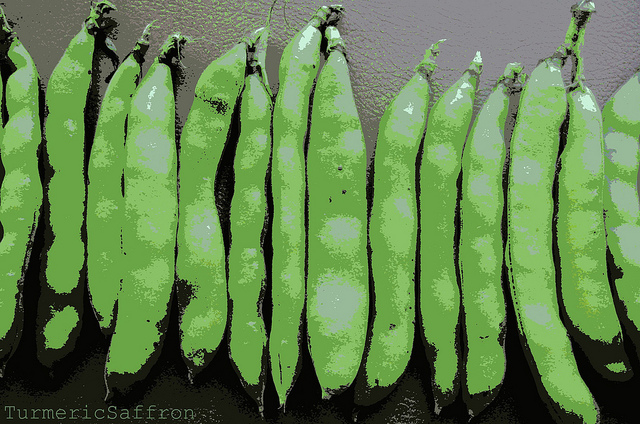 Fava bean season is very short but it's worth the wait. 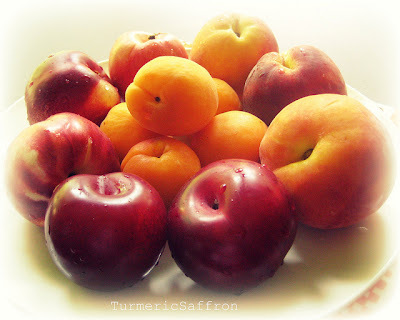 They are soft and creamy when cooked and have a nutty flavor and are quite addictive. It's hard to find fresh fava beans in the super markets and vegetable stores where I live, they are mostly available dried. 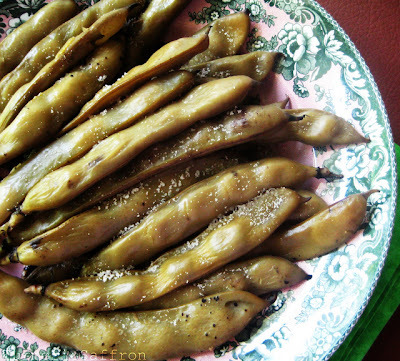 This is a down-to-earth finger food that you cook and serve to people that you are comfortable around because it may be a little messy removing the layers with your fingers, but that's part of the enjoyment of eating cooked fava beans! My guess is that since fava beans were cooked in large quantities for many people in the past it would have been too time consuming to remove not one but two thick and tough layers of skins, therefore cooking the whole thing all at once was a better option and an easier and quicker way of dealing with these hidden edible treasures. This way, everyone in the family would participate and join in on the fun task of removing the layers for their own consumption. 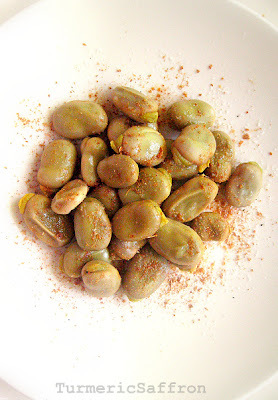 Thus, this recipe is very easy and there's almost no preparation time besides rinsing them and washing the outer layer under running water, while they are nestled in their waxy pods. However, if you prefer, remove the shells before cooking. I remember the spring that my parents decided to plant fava beans in our side garden. They grew fast and became tall and beautiful. On a beautiful sunny afternoon, when all the energetic kids on our block came home from school, this fava bean field seemed like such a great place for playing hide-and-seek. The aftermath wasn't pretty though and the ground ended up being covered by ravaged fava bean plants. Let's just say my parents weren't too pleased with what they saw early that evening! That was the last time they planted fava beans in our garden. Rinse fava beans and place in a large pot. Pour enough water to cover all the beans. Bring to a boil over medium-high heat. 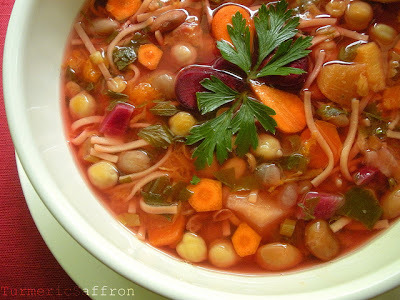 Reduce heat to medium-low and cook for about 50 minutes or until the beans thoroughly cooked. Add salt to taste in the last 10-15 minutes of cooking. Once cooked, drain the water, let cool a few minutes and remove the thick outer layer. 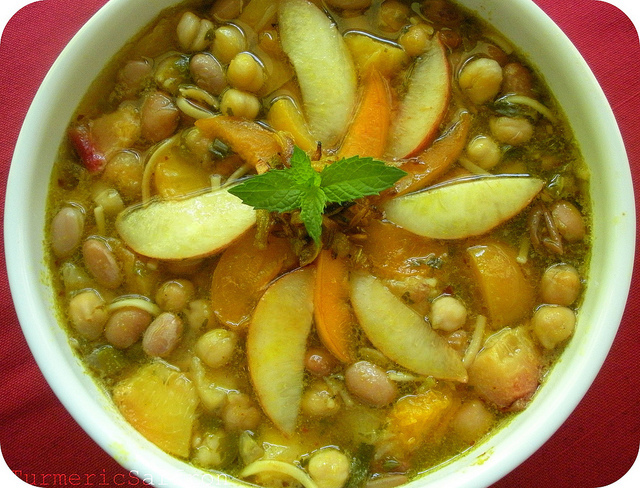 Also, as a word of caution, fava beans cannot be eaten raw and need to be fully cooked. Serve warm on a platter with angelica powder, lemon/lime juice and salt. 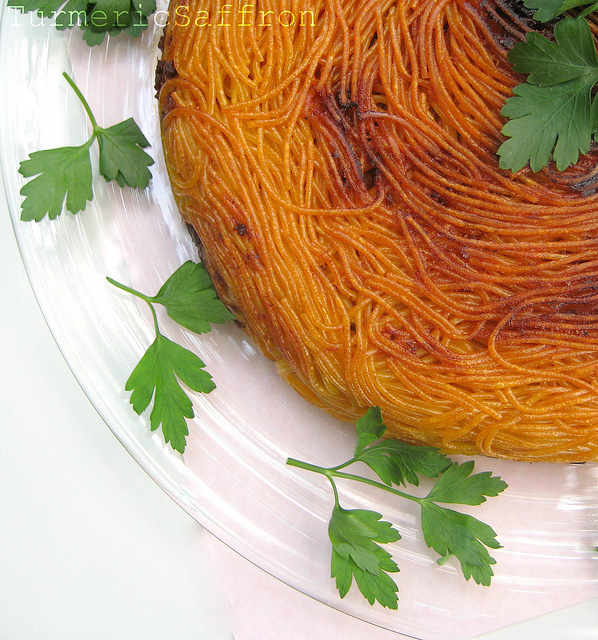 In one of my earlier posts I wrote about Persian macaroni. 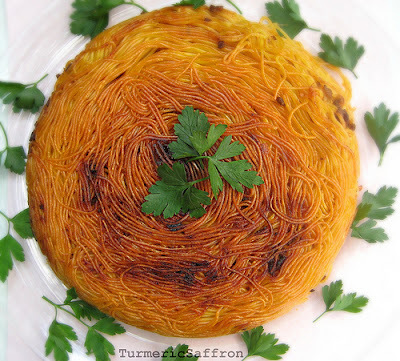 This is a revisit with a focus on making the ته دیگ ماکارونی macaroni tah-dig (crust at the bottom of pan), where the noodles meet the hot oil with a pinch of turmeric and form a flavorful and golden crunchy layer at the bottom of the pan. A good tah-dig is crispy but not burned, crunchy but not hard. Those of you who are familiar with Persian food know that tah-dig is one of the most sought-after parts of a rice dish. Personally, I prefer the flavorful tah-dig over the fluffy and aromatic rice! Noodles also make a delicious tah-dig when making pasta. If by any chance the tah-dig turns out a bit harder than what you expected it to be, pour a spoonful of sauce over it and spread to soften it a bit before biting into it. 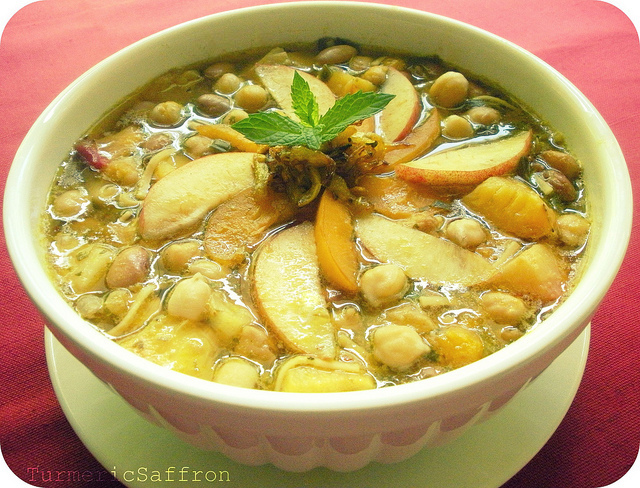 Here's a link to my other tah dig recipe : The Art of Making Persian Tah-Dig. For a family of six kids, simple and easy macaroni (Persian style pasta with ground meat and tomato sauce) always had a place on our dinner table while growing up. It was one of my favorite dishes then and now I enjoy making it for my family. Back home, my mother always cooked pasta with the hollow spaghetti noodles (bucatini). 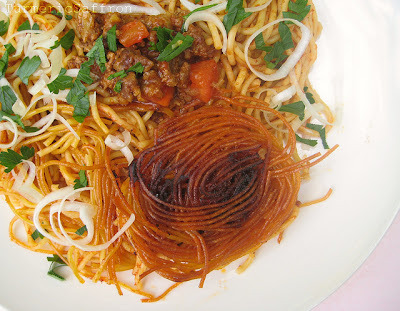 I liked those hollow noodles and I've looked for them many times in the past while grocery shopping but I haven't seen them on the shelves anywhere. It seems that they aren't as popular as the other kinds of noodle varieties here. In a large skillet heat 3 tablespoons of oil, add onions ad saute onion over medium-high heat heat until translucent. Add the garlic and saute for 2-3 minutes. Add turmeric, stir and continue cooking for another minute or two before adding the beef. Break the beef into tiny pieces with a fork and brown. Scoop out any excess fat. Salt and pepper to taste. Add in the tomatoes and the tomato sauce and 1/2 cup of water. Cover and cook on medium-low heat for 20-30 minutes. Taste and adjust the seasoning. In the meantime, bring large pot of water to boil and cook the noodles according to the package instructions but drain 2-3 minutes before it becomes al-dente, since they'll cook further later on when combined with the sauce in the same pot. In a non-stick heavy-bottomed pot, heat 2 tablespoons of olive oil, add a pinch of turmeric and swirl the pot around to evenly coat the bottom. Add a layer of the noodles, then a layer of the meat sauce, and continue layering till both the sauce and the noodles are done. Place a clean and soft kitchen towel between the pot and the lid. Close tightly and cook on medium to low heat for about 45-50 minutes. The longer you cook it, the thicker the crust but you also don't want to risk getting it burned. To serve, place a large serving platter over the pot, and with a kitchen towel hold on to the sides of the pot and carefully turn over the pot to get the pasta with it's tah-dig intact and in one piece. Cut into it as if you are cutting a slice of a cake. 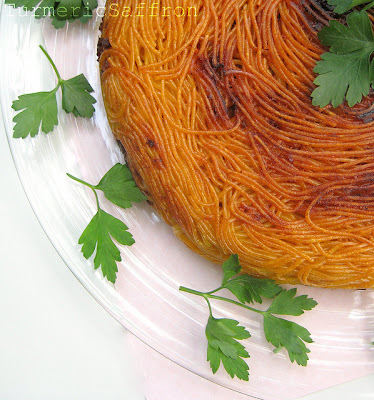 Or, spoon noodles and the sauce mixture onto a platter and sprinkle with freshly chopped parsley. Remove the crust gently and place on the side of the platter or on a separate dish.